Now it’s no secret that oil has been a big part of many of the ongoing wars over the past few decades. The threat of terrorism has also been, but in a manipulative way. Those who have tracked the investigations into 9/11 that followed the event know that the official story we have been told is false, so why did we hear a lie? Why were we told something happened that didn’t and what sort of enemy was created as a result? 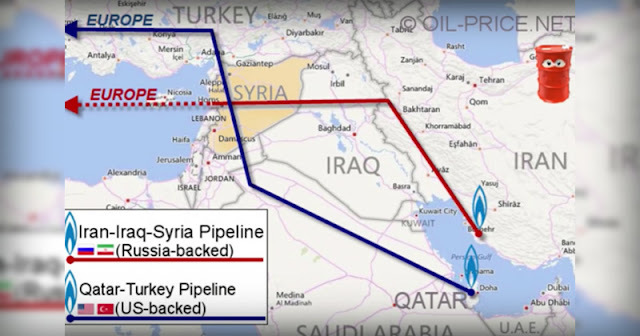 Two natural gas pipelines travel from the Middle East and into Syria right where it enters a port that leads to Europe. The Russia backed pipeline runs from Iraq and into Syria, while the one that is US backed runs from Qatar. The more we understand how our world really functions ,the more we can begin to see through the lies and manipulation being used to control us and keep us down. This isn’t about us vs them and having to fight back, it’s about KNOWING. When you become aware you begin to see the world very differently and ultimately you make different choices. You no longer just follow along your daily actions robotically, you think about things, you get in touch more with YOU and your own stream of thought. This is a shift in consciousness that helps to change the way we think as a whole, and as we do that physical changes follow in our world. With a new way of thinking and seeing things we take different actions. Often times we also venture onto a spiritual path of exploring more about who we truly are and what it means to be human. This is ultimately what drives the greatest change and it can start with seeing our world more clearly vs blindly following it or avoiding what’s really going on.